Last year while I was seriously thinking about buying myself a new sewing machine I bought this book from the author of one of my favourite crafting blogs - angry chicken. 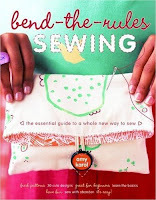 This is a very approachable book for a complete sewing machine novice like myself and starts out with a great section on sewing basics (including a very useful shopping list of kit you will need when you start, some basic hand sewing advice and a little detail about buying fabric). The second section is devoted to 30 projects all of which are simple, attractive and would be easy to make adjustments to if you want to produce a more unique item. There are some lovely patterns in here for simple bags which I will hopefully get around to trying out one of these days as they would make perfect gifts in this new anti-plastic world. There are also some very cute projects for kids, the little woodland elf hat pattern has been my favourite since first browsing through this book last year. As Christmas is fast approaching I thought I would take a little time out from my various Christmas crafting projects and whip up this little hat for my own little elf. Instead of using pre-felted wool I bought some velvety green stuff from our limited local haberdashery and as this is a devil to sew normally I just stuck with hand sewing the whole thing instead of trying to fight the sewing machine into doing it for me. I'm very pleased with how it looks and I'm glad that it fits okay (it's a little loose but it'll do) as strangely this project didn't mention what age child the hat is aimed for. I also found that the line drawings included in the instructions were not too clear and so it took a bit of guess work to figure out what side of the pieces I was supposed to be sewing together. 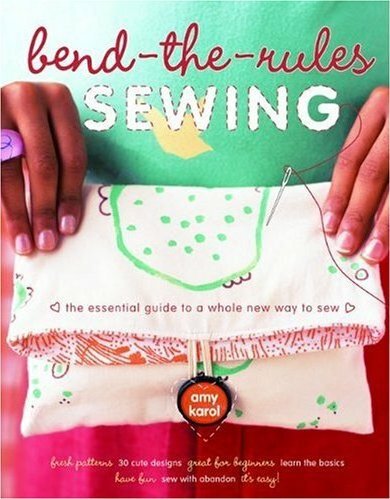 Even though there are a few problems with this book it is still a great starting guide with lots of practical tips for those new to sewing. The projects are lovely and look so simple that they should encourage anybody who is just starting out sewing to have a go. Sorry for the lateness of this Friday review - my little Imp (oops - Elf) apologises but as he has just figured out crawling and hoisting himself up on things he doesn't really like to sit still for too long.